Today is Memorial Day, a day to remember those we have lost to war and those we have lost whom we love. I thought I would post a sermon in acknowledgment of the day. The following sermon “Good Grief” was preached at the Community Congregational Church of Pacific Beach on May 30, 2010. This particular sermon provided a context to speak to my congregation about our collective grief. I find it highly relevant a year later, so I am posting it here. For all those we have loved and lost…we remember on Memorial Day. Decoration Day has played an important role in American communities. As early as the 1880’s Decoration Day was also called Memorial Day in the South. This name change to Memorial Day in the South may have been a political one to accommodate people who also mourned Confederate soldiers. (3) So Decoration Day became “Memorial Day.” But I feel compelled to point out to you that to this day in the South, Memorial Day, in addition to being a day to honor those who died in the Civil War and World Wars is still held as a day set aside to remember and honor all those loved ones that the community has lost from its corporate life. Some of you know that my father’s family is in the South. 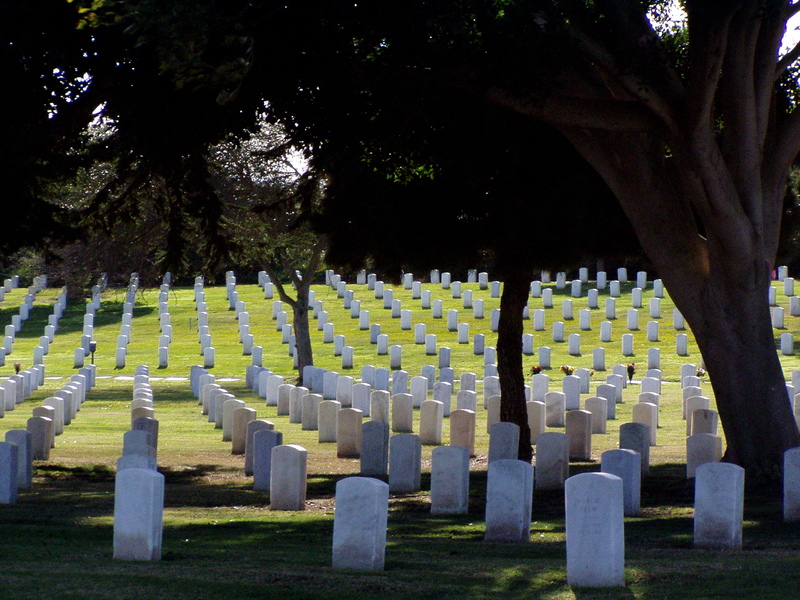 I can tell you that in rural Alabama, Memorial Day—and indeed the remembrance of loved ones who have died—is a bit different from it is here in urban California. Here we have large cemeteries in different regions of the city and often you have to go out of your way to get there. There, cemeteries are scattered everywhere throughout the community, and often they have no walls or fence— just acreage you pass daily on the sides of the roads. As is common in that rural area, my own father is buried in the churchyard of the church closest to the family land. Many people visit the graves of loved ones daily or weekly. This is part of the Southern culture and expected of those who mourn. But even after mourning, there is a cultural expectation of remembrance. My step-mother in Alabama makes silk floral arrangements and she will tell you that most of her business is done between April and May each year preparing floral arrangements that will decorate the tombstones of loved ones on the local celebration of Decoration Day and when flags are added to the graves to recognize Memorial Day. And yes, in parts of the South some people plan these arrangements out months in advance. To neglect to decorate the graves of your loved ones this time of year it is a serious cultural taboo akin to forgetting Thanksgiving and Christmas. In some ways all this effort of decoration seems strange. But in some ways, being adopted into my step mother’s culture, it makes sense and seems almost comforting to have a communal event remembering and honoring individual losses and creating public space for the needs of those who grieve. Mourning and grieving is not something we often talk about. Because we avoid it, some even say that observation of Memorial Day should be returned to May 30th rather than observed as a three-day weekend that serves more as the opening of summer than the national day of mourning and remembrance it was intended to be. We must admit that with all the commercial sales and BBQ’s and our beautiful beaches mourning and reflection is not something that we really want to do—not with summer coming! Indeed there are many reasons to be distracted from the reality of death. Our text this morning, however, is one that speaks of the realities of death and is one that clearly shows us a religious custom of grieving. The eleventh chapter of John and its account of mourning leading up to the raising of Lazarus is a text packed with theological implications. There is the question of why Jesus waited two days rather than going to Lazarus immediately and why this seemed so offensive to Mary and Martha. There is the conversation between Jesus and Mary about who and what resurrection is—and its underlying debate about the existence of an afterlife that persists in the Jewish faith. There is the implication that discipleship means following Jesus even when the journey is potentially to one’s own death and then there is the whole issue of Jesus having control over life and death in what comes next in the gospel—the raising of Lazarus, which in the Gospel of John will be the last straw that leads the temple authorities to arrest Jesus. He simply wept for his friend Lazarus. And the grief of Lazarus’s sisters. Before the gospel account gets on with its important points of drawing parallels between the raising of Lazarus and the resurrection of Christ or illustrating that Jesus has power over death or even suggesting that God is about to do a new thing, never seen by humanity, it proclaims that even the Son of God pauses to mourn and to grieve. It is a gospel lesson that we may do well to relearn in this twenty-first century. Too often in our fast paced world the once-natural processes of life and death are rushed so production is not slowed and we don’t fall too far behind. In some cultures it is normal to have an extended period of mourning when a loved one dies. But too often in our American culture, we get three days’ bereavement leave. According to tradition not only would Lazarus’ sisters have a week of mourning after the funeral but another month of lesser mourning and, depending on the relationship one has with the person who died, the period of mourning may last up to a year. To us this period of mourning may seem a luxury, but it may be necessary. Before the Civil War, death was a common part of life. In the period following the Civil War, when Decoration Days were first established, the numbers of deaths society had to adjust to because of the war was uncommon and so required a new approach to corporate mourning. How we might ever cope with our grief is a good question. It seems clear that we can’t avoid mourning. It seems clear that a short bereavement will not fill our needs. The Gospel of John shows the human and divine Jesus pausing to mourn. Generations before us have set time aside for us to grieve and remember those who have died. Many religious traditions, including our own Christian seasons of Lent and Good Friday, require periods of mourning. Still, culturally we avoid mourning and deny death. Lamentations is one of the few books permissible for Jewish mourners to read. It is a book that chronicles the complaints and grief of the people following the destruction of Jerusalem in 587 BCE. Here we find an ancient doxology detailing God’s faithfulness, speaking from a time and place that seemed to its author the end of the world. It’s not just about faith, but there is something more in it. The word “hope” it uses (in verse 21) also means “expectation” indicating that even in the most dire of times we can expect God’s faithfulness. (6) Perhaps this was the source of the expectation Mary and Martha had of Jesus to come to Lazarus. Our modern expectation is not necessarily that God will fix all things to our liking but an expectation that God will come and be there in depth of our despair. We never know when God may do a new thing. But we know God is present with us in our joy and in our sorrow. There is a wisdom we have been given which we may want to recall this Memorial Day, as we remember our personal losses, and as we mark the death of 1000 American soldiers in Afghanistan. “Memorial day” [on-line] at http://en.wikipedia.org/wiki/Memorial_day accessed On May 29, 2010. “Confederate Memorial Day” [on-line] available at http://en.wikipedia.org/wiki/Confederate_Memorial_Day accessed May 29, 2011. The Broadman Bible Commentary. Vol.6. (Nashville:broadman, 1971) 216.